No matter what the weather feels like outside, a properly functioning heating, ventilation and air conditioning (HVAC) system in Los Angeles California ensures that your indoor climate is always comfortable. Since your AC and Heating system runs throughout the year to maintain optimal temperatures and humidity levels, you’ll want a system that is energy-efficient, dependable and easy to maintain. B & M Air and Heating Inc is a trusted Los Angeles Heating & Air Conditioning contractor, well equipped to handle installation, maintenance and repair of residential and commercial HVAC systems. For more than 5 years, we’ve shared our knowledge of HVAC systems with local residents and business property owners. Call us today at (323) 402-4203 to discuss any of your AC and Heating needs. Your HVAC system’s design must be carefully chosen, or you’ll always have problems getting comfortable. This includes the type and layout of your system’s duct work as well as the size of the Heating & Air Conditioning system. As an experienced HVAC contractor in Los Angeles, we take multiple factors into consideration before generating a design that is right for your space and usage needs. For residential projects, we look at your home’s size, layout, insulation levels and geographical location to design the appropriate heating and cooling system to best suite your needs. We calculate HVAC system sizes in accordance with ACCA standards and choose systems that provide you with the best long-term value. HVAC systems can last up to 15 years when properly maintained. When neglected, systems can and do break down at the most inconvenient times. To avoid system failures during sweltering summer months or the frigid winter season, call B & M Air and Heating Inc at (323) 402-4203 to schedule your next Los Angeles HVAC service appointment. During these service calls, we inspect critical HVAC components, clean condenser coils and replace filters. As part of our extended services, we also clean ducts and vents to keep your indoor air as clean as possible. We recommend that you have your AC and Heating system serviced annually. For over 5 years, we have been earning the trust of customers through our professional knowledge and uncompromising integrity. The Los Angeles HVAC technicians at B & M Air and Heating Inc maintain their skills through regular training, and many are factory certified to work on the industry’s most recognized brands. 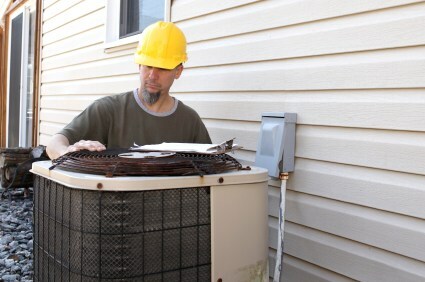 As a result, our crew can repair any HVAC system, whether it was purchased from us or from one of our competitors. We also offer expert advice about HVAC replacement when your current system reaches the end of its useful life. If your Heating & Air Conditioning system is not working optimally, give us a call at (323) 402-4203 to restore comfort to your home or office building. Experienced Staff: An industry leader since 2014, the fully trained staff at B & M Air and Heating Inc have years of experience. Ask about our list of references and talk to our satisfied clients, covering both the commercial and residential markets. Prompt Service: B & M Air and Heating Inc promises prompt service. Hire a dedicated HVAC contractor that will arrive on time and provide the attention your project deserves. Call B & M Air and Heating Inc at (323) 402-4203 for swift service you can count on. Up To Date Training: B & M Air and Heating Inc technicians work hard to stay up to date with the latest information on HVAC equipment and mechanical designs, providing you with the knowledge and expertise to make wise decisions. As a leading HVAC contractor, B & M Air and Heating Inc is serious about staying on top of industry advancements, allowing you to maintain peak efficiency with your heating and cooling systems. B & M Air and Heating Inc is an industry leader with years of experience, dedicated to prompt service and keeping up to date with the latest innovations in heating, cooling and air quality systems. Call B & M Air and Heating Inc at (323) 402-4203 to arrange for a site visit and get the leading HVAC contractor in Los Angeles on your side!